Reverse osmosis and distillation are common methods of water desalination, but energy requirements are high. Forward osmosis is a recent development that promises to reduce energy costs and operational complexity, as well as the ability to make use of low quality waste heat. Water desalination is becoming increasingly important with the pressure placed on natural water systems by short and long term climate variation. There is a huge amount of water available in the oceans, but this cannot be used because of dissolved salts. 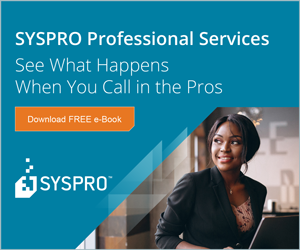 Although the energy consumption associated with the desalination process has reduced dramatically, it is still an important factor which must be taken into account when considering options. Reverse osmosis, which requires pressure to operate and consumes primarily electrical energy. Evaporation/condensation plant which uses primarily thermal energy for its operation. The energy requirements of each type are given in Table 1 . Table 1: Energy requirements for various desalination methods. 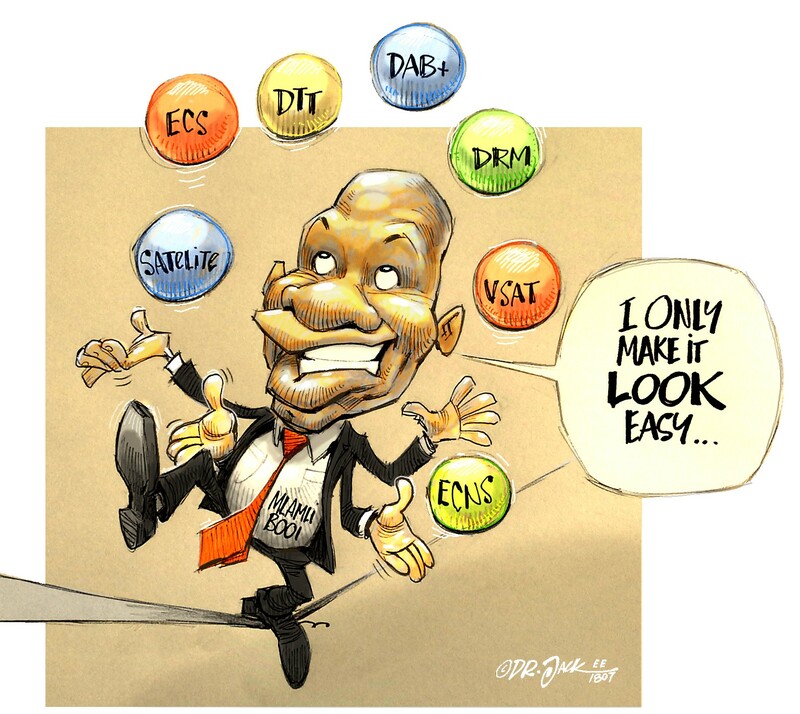 None of these systems have the ability to make effective use of waste heat. A development known as forward osmosis promises to combine electrical and thermal energy to give a lower cost as well as the potential to use waste heat produced from industrial and power generation processes to produce quality water. Osmosis is the process whereby water molecules move from an area of low concentration of dissolved salts to an area of high concentration (the draw solution). The movement will continue until the concentration in both areas is equal. Osmosis can be controlled by the use of a semi-permeable membrane which allows passage of water molecules but blocks the large solute molecules (see Fig. 1). If one of the liquids is pure water, the process continues diluting the dissolved salts in the other solution. The rate of transfer depends on the osmotic pressure, which depends on the difference in concentration between the two solutions. Fig. 1: Permeable membrane osmosis. The flow of water can be reversed by applying pressure to the solution with the higher concentration (see Fig. 2). This is the basis of all reverse osmosis (RO) desalination systems. 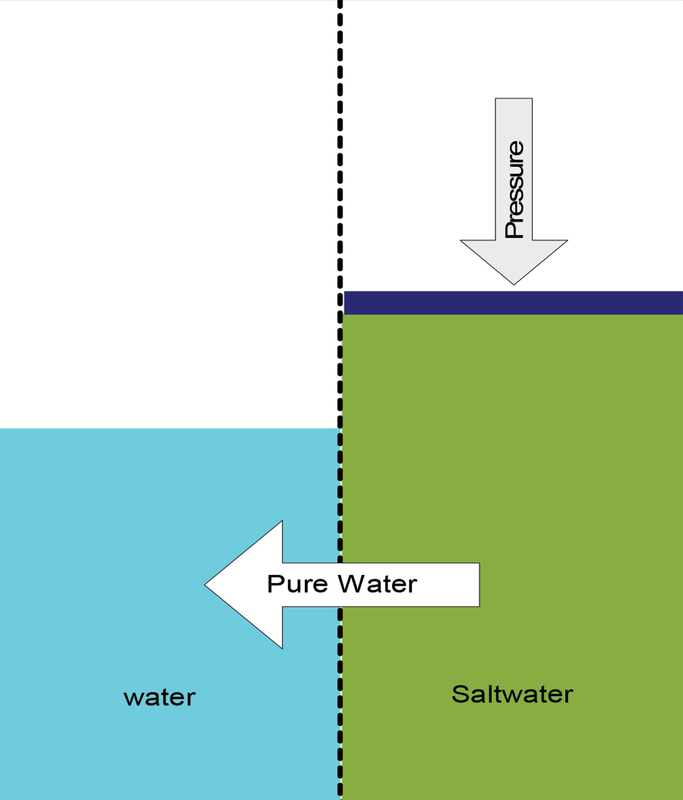 Pure water passes from the saline solution through the membrane under pressure to the other side. The application of pressure to force the movement of water through the membrane requires mechanical energy, and this constitutes the main energy consumption component of the system. Fig. 2: Pressure reverse osmosis. If instead of pure water, a draw solution with a higher solute concentration than the saltwater is used, water will move from the saltwater to the draw solution across the membrane, resulting in a diluted solution. This movement does not require any external pressure. Forward osmosis (FO), also known as engineered osmosis, requires the combination of two primary components: an FO membrane system and a draw recovery system. FO is driven by an osmotic pressure gradient created across a semi-permeable membrane to achieve spontaneous and preferential diffusion of water molecules. The problem then remains one of recovering the water from the diluted draw solution. This is accomplished either by heating the draw solution to evaporate the solute, or by a membrane recovery system (see Fig. 3). Fig. 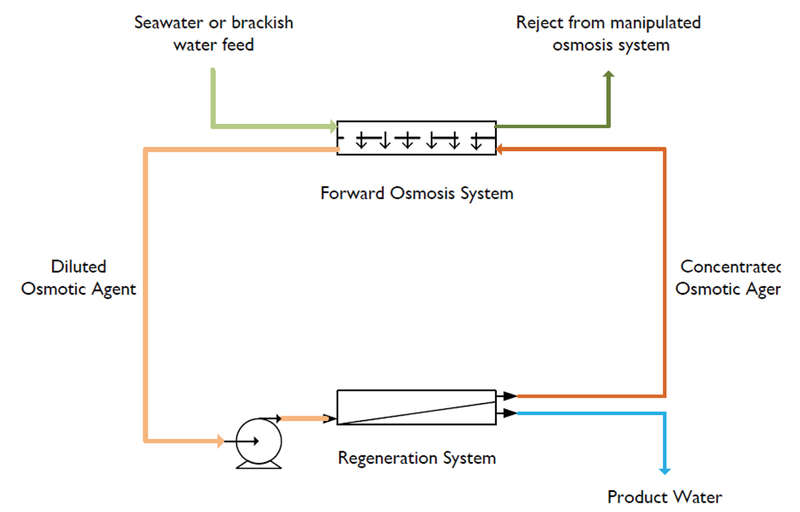 3: Forward osmosis desalination principle . The solutes used in the thermal system evaporate at much lower temperatures than water, and can be removed without affecting the water. Evaporated solutes are condensed and returned to the draw solution. The recovery of water from the draw solution is the biggest user of energy in the process. Recovery is effected by heating the solution, which causes the dissolved draw solution salts to vaporise, leaving a high quality water behind. The latent heat of vaporisation of the draw solution components is much lower than that of water, and so provides a high energy gain over other methods, as low quality heat at relatively low temperatures can be used, making the system an ideal candidate for waste heat application. 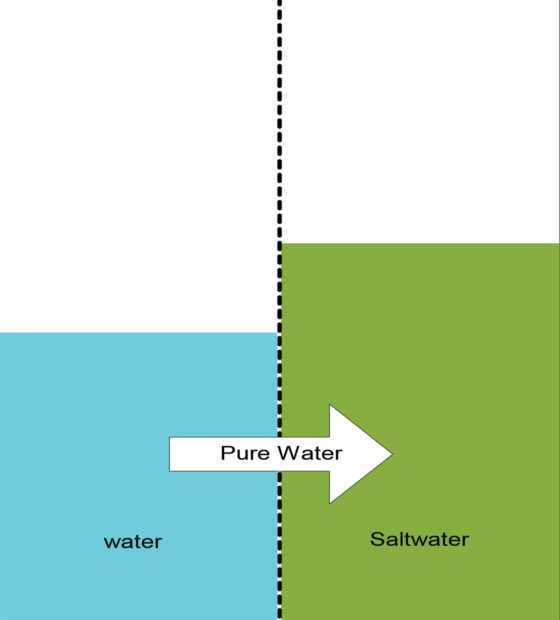 The theoretical absolute minimum amount of energy required by natural osmosis to desalinate average seawater is approximately 1 kWh/m3 of water produced. Opinion on the energy requirements of the FO system seems to vary from savings of ≈70%, to greater than that of other systems . General opinion seems to be that FO energy usage is of the same order as, or higher than RO energy usage, but most of the conclusions are based on theoretical modelling and not on actual systems, and depend very heavily on the model used and the draw solution composition analysed. The FO system is nonetheless far better than any of the distillation processes. Table 2 shows a comparison of energy requirements from one study . A commercial product claims 30% lower energy usage than conventional RO, (supplied by the same company), without the use of waste heat . Table 2: Comparison of energy requirements for desalination systems . These do not take into account the fact that most of the energy required would be low grade thermal, and could make use of waste heat at a very low cost. This limits the use to areas where low grade thermal waste heat is available at coastal locations, but does not necessarily restrict the use of the technique. The process may use very low temperature heat, as low as 40°C, given an ambient temperature of 20°C and approximately an order of magnitude less electrical energy than RO . 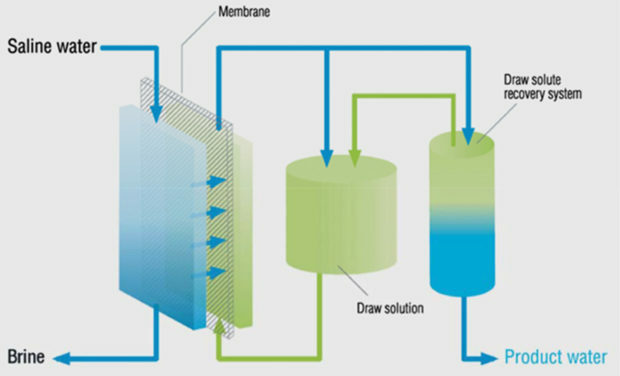 The FO process is more efficient than conventional evaporative desalination processes, as it is the solute which is removed from solution by a change of phase, rather than the water itself. Furthermore, the FO process does not require the multiple stages, large heat transfer areas, and large pumping volumes required by MSF and MED. An obvious application is power stations located on coastal sites, which already use sea-water for cooling, including nuclear, coal and CCGT thermal stations. Open cycle gas turbine have a high degree of waste heat but are generally not used for continuous operation cycles. Other possibilities include coastal industrial areas, such as Richards Bay, Coega and others. The draw solution or osmotic agent. The draw solution recovery system. There are two recovery systems in use: thermal recovery and membrane recovery. In the thermal recovery systems the draw solution used must be thermolytic in nature, i.e. consist of components which decompose when subjected to heat. Thermolytic decomposition is used to remove the solute from the draw solution, and recover the water. A successful draw solution has been identified in the form of a concentrated solution of ammonium (NH4+) formed by the dissolution of ammonia (NH3) and carbon dioxide (CO2) in water. The salts exist in the draw solution as an ammonium carbamate solution (NH4CO2NH2). The high solubility of this draw solution provides an extremely high osmotic potential and produces a strong driving force across the membrane. These salts are highly soluble; create high osmotic pressures; diffuse relatively rapidly in solution; are well-rejected by semipermeable membranes, and may be removed from solution by the simple addition of low-quality heat. Ammonium carbamate begins to decompose at 20°C and it decomposes rapidly and completely at temperatures above 60°C. This property allows the removal of the components from the draw solution using low quality heat. When heat is supplied, the salts decompose into ammonia and carbon dioxide gases for simple stripping from solution. The low temperature required to bring about the thermolytic decomposition favours the use of waste heat, lowering the overall cost of the process. Fig. 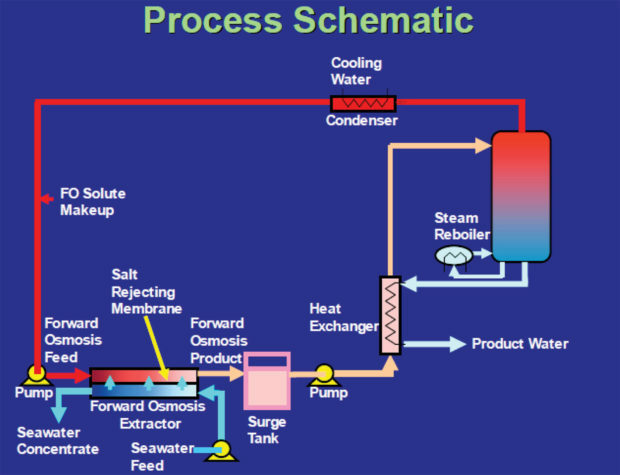 4 shows the process schematic of a FO system using thermal recovery. Fig. 4: Forward osmosis desalination plant (FODP) process schematic . A thermal recovery system using waste heat was installed successfully at the Chanxing power plant in China to process waste water from the flue gas desulphurisation blow down and cooling tower blow down to produce boiler feed make-up water . The membrane recovery system uses a pressurised RO process to separate the water from the osmotic agent. This process requires energy but the osmostic agent and the membrane are chosen so that the energy is significantly less than that required for the conventional RO process. Fig. 5 shows a diagramme of an FO system using RO recovery. Fig. 5: FO system with membrane osmotic agent recovery . A membrane recovery system with a capacity of 100 Ml/day was installed and operated at a site at Al Khaluf, in the Sultanate of Oman . Table 3 gives a comparison between RO and FO plant manufactured by the company supplying the system. In the wake of recent drought, Cape Town is considering water desalination as a source of potable water. The long term plan appears to be for water desalination in the order of 500 Ml/day. Interim plans involve relocatable smaller plant close to residential areas which could be consolidated into a single plant at a later date. The energy consumption requirements of these modular plants has not been mentioned in public documents. To keep the amount of plant as low as possible would mean continuous operation, which results in a continuous steady demand on the power source. To produce this amount of water with conventional RO plant operating continuously over 24 hours would require up to 85 MW of power, and allowing for other associated plant, 100 MW would seem a reasonable assumption. This type of operation could result in a long term power purchase agreement with guaranteed off-take and guaranteed pricing, which would favour an onsite IPP, and the City’s goal of purchasing green energy directly would favour this. Water is an essential requirement which could be subject to fixed long term pricing. Table 3: Comparison between FO and RO plant at Al Khaluf . With the current surplus of electrical energy, the seemingly obvious choice would be to use grid power under some sort of special pricing agreement, as this qualifies the plant as an electricity energy intensive industry or user. The fact that the plant provides a continual baseload demand affects the pricing. However the disadvantage is that the loads cannot be shifted or varied to accommodate time of usage tariffs, and to take advantage of off-peak periods, although continuous production has a natural advantage. One assumes that over production during low demand periods will be stored in water reservoirs. The other long term option would be to use FO. The Koeberg nuclear power plant uses sea water to cool steam from the turbines and it may be possible to divert some of this waste heat to a FO desalination plant, with a great savings of energy. A plant of the size required would consume about 7% of the electrical output of Koeberg if RO is used. The stated intention to locate the final desalination plant on a site adjacent to Koeberg is an added incentive to choose this option. The complexity of diverting waste heat from Koeberg to an adjacent site has not been investigated but remains a possibility. M Rycroft: “Water desalination and energy”, Energize, December 2014. M Pendergast, et al: “Going big with forward osmosis”, Desalination and water treatment, December 2016. R McGinnis: “Global challenges in energy and water supply: The promise of engineered osmosis”, Environ. Sci. Technol. 2008. A Moon and M Lee: “Energy consumption in forward osmosis desalination compared to other desalination techniques”, International Journal of Chemical and Molecular Engineering, Vol. 6, No.5, 2012. P Nicol: “Forward Osmosis desalination: A commercial reality”, International Desalination Association World Congress, Perth, Australia, 2011 (IDAWC/PER 11-198, 2011). C Moody: “Desalination by forward osmosis”, AMTA 2007 conference.